Warm up with Golden Sunshine as it gets colder! Prayer Beads, made with one of our birthstone of the month prayer beads, are not only created to be beautiful to your eyes, but also to your yoga soul and spirit. And why not? Our prayers are messages our souls give to the great divine, so it makes sense that prayer beads are a reflection of both prayers and divine energy. Become your Lotus with one of our mala prayer beads by choosing your favorite gemstone, your birthstone or your Zodiac sun sign. If November is your birth month, then your golden birthstone would be amber, topaz, yellow topaz or citrine, and your sun sign would be either Scorpio or Sagittarius. You may think that there’s nothing that these stones can do for you, November-born friend, but you would be surprised on how well the stones complement the Zodiac. First, a quick run-through of your blessed birthstones, and we are especially proud of our genuine amber! Our Genuine Amber Mala Prayer Beads, the beads are imported directly from Poland and is genuine, light Petrified Tree Resin, formed into beads, and we then carefully craft them into prayer beads. You can read about this process here called autoclave. Amber autoclave preserves the inherent inclusions in the amber resin, much better than the traditonal heating methods that make the amber milky. Our amber looks like golden clear crystal, and real inclusions can be seen like in Jurassic Park. Please, do be careful of faux amber now, plastic has these disk like inclusions, and when heated smells like plastic. As far as healing…. 1. Amber Draws negative energy and disease out of the body. 2. Eases stress, allowing natural, complementary healing to take place. So, for November, it’s the best! The Topaz/ Yellow Jade Solution. 1. 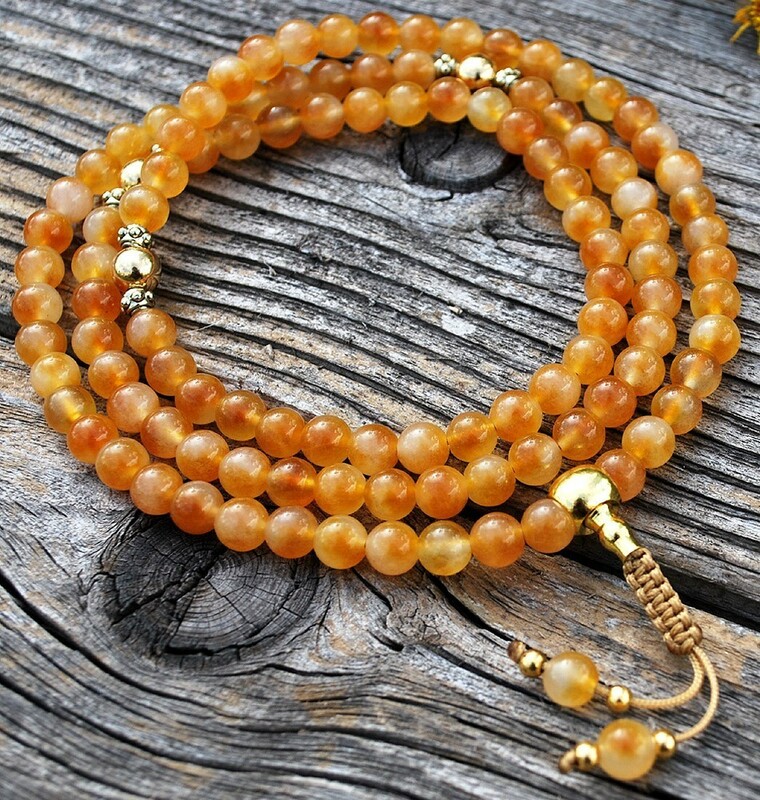 Yellow Topaz/ Golden Jade is a powerful gem that aligns you in all of your intentions. It is the stone of faith and manifestation of divine will in your life. 2. Plain topaz isn’t so plain; it is a stone of love, joy, and good fortune, and capable of aiding you in attaining your goals. We don’t carry yellow Topaz malas, but offer yellow jade, similar in tone here. Citrine, the stone with the power of the sun, similar in power to amber, is also a stone that can cleanse your soul, it can also help relieve depression and help you overcome your phobias. At the heart of November, a Scorpio is born between the 1st and the 22nd and you, Scorpio, are naturally goal-oriented so topaz, yellow topaz or citrine are perfect helpers in your chosen life’s path. For those born on November 23rd and beyond, are Sagittarians, are known to be adventuresome and independent. These qualities are also naturally enhanced by the mala Zodiac birthstones. So, as you can see, there is much we can offer to enrich your mind and spirit with sunny golden tones during the celebration of your birthday!